The moment I arrived at her home; Esther invited me to one of her huts and just spoke for hours – allowing me to ask any question in my broken Ndebele, Xhosa and Sepedi. So, where did it all begin? Esther was taught to paint by her mother and grandmother at the age of 10 and underwent the traditional Ndebele practice in which young women are cloistered from society for a few months and taught the traditional craft of beadwork. 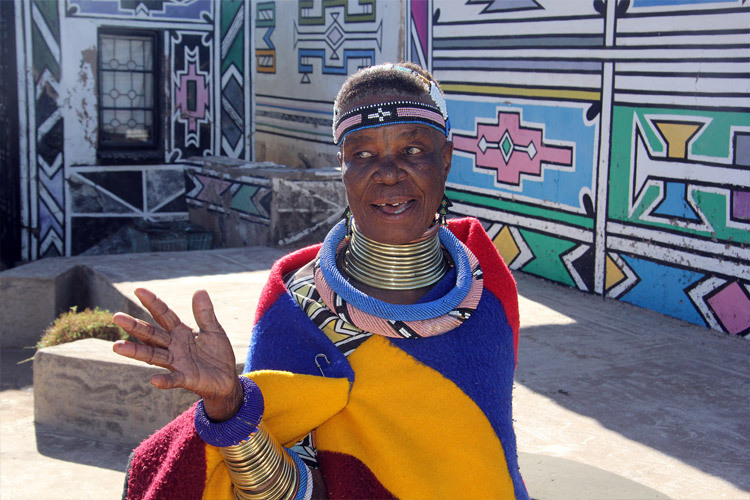 She has since become an expert and an authority figure in executing the traditional Ndebele art of wall painting in South Africa; an art form traditionally only done by women on special occasions. These early lessons would later serve as a training ground for her artistic career and to this day she remains true to the Ndebele traditions because she doesn’t want them to vanish. Esther’s house in Mabhoko Village. What’s unique about Gogo’s work is that although it is heavily rooted in tradition, she is not apposed to evolving and expanding the art form. 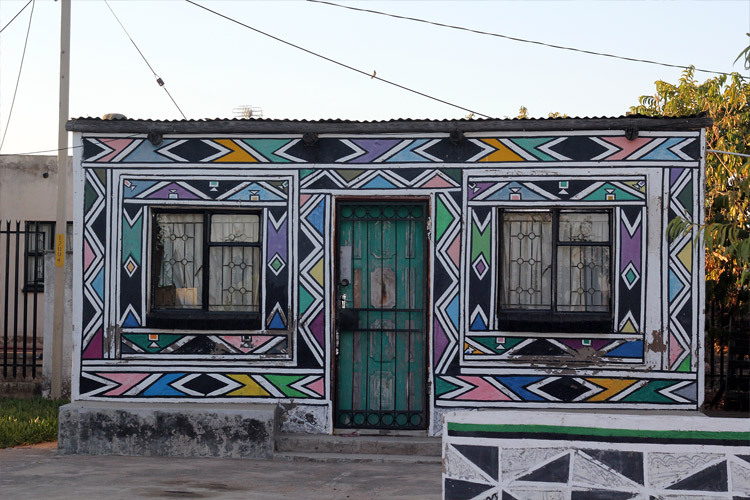 In the past, Ndebele painting was reserved for the outer walls of houses but Esther is one of the first artists to transfer these traditional designs to canvas and other mediums – making her an Ndebele art pioneer. 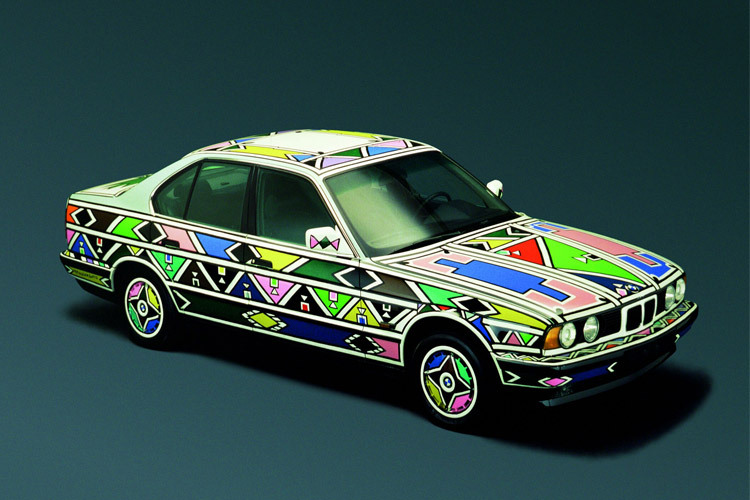 In 1991, Esther coated the entire bodywork of a BMW 525i, for the first time, with bright colours and clearly distinguishable geometric shapes typical of Ndebele tribal art. She was also the first South African to have her work exhibited at the Museum of Arts and Design in New York in 2010. 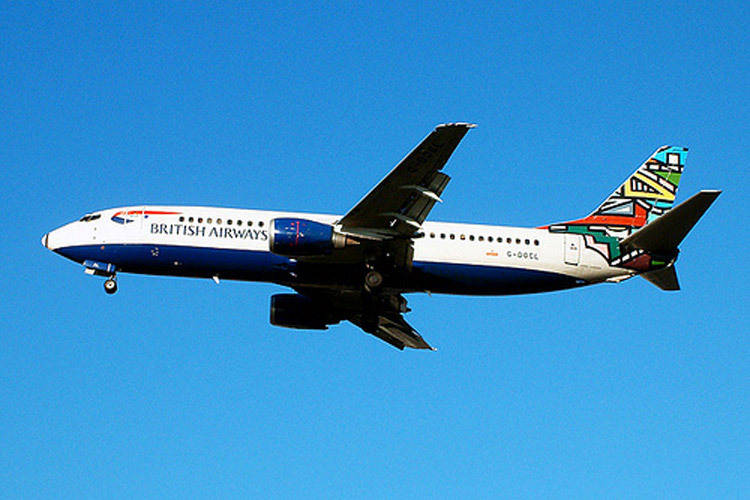 Since then she has taken her work to the stratosphere having been commissioned to paint the tail of a British Airways Boeing. In 2014 she also was commissioned by the Virginia Museum of Fine Arts in the US to create two large works of art. Esther has began to transpose her art on canvas, shoes, sculptures, ceramics and other modern materials. What’s astounding about her work is that despite the varied canvases she paints on; she still paints freehand without prior measurement or sketches and continues to use feathers and bundles of twigs as brushes – the old-school way. Despite being an internationally recognized artist, Gogo still lives in Mabhoko Village in KwaMlanga, Mpumalanga and does her chores like any ordinary Gogo in the village – sweeping her yard early in the morning, cooking and teaching young people Ndebele art. Before I left, I asked her how she still does it all on her own at her tender age of 80 to which she simply replied: by keeping busy and surrounding herself with her grandchildren. A warm, good hearted and down to earth woman – Esther understands that things change and culture evolves. Her story is one of legends and her contribution to the preservation and expansion of Ndebele artistic and cultural heritage is worth telling a thousand times. 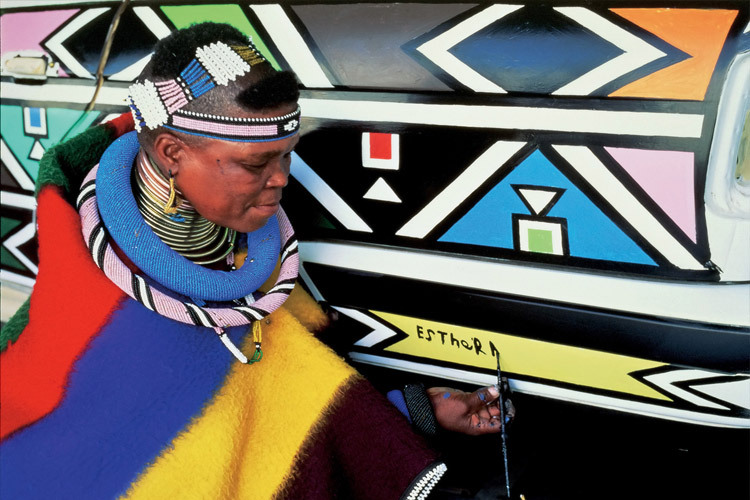 Esther’s Solo Exhibition, ‘Esther Mahlangu 80’, will open at the UCT Irma Stern Museum on her birthday 11 November – 2 December 2015. Her latest sneaker collaboration with Swedish Design House EYTYS was just launched at Paris Fashion week in June and will be available at high end fashion outlets in NY, Paris and Milan in 2016. I am intrigued by Ndebele art especially after learning that all that geometrical drawings are by free hand, no measurements, no sketches and the only medium used are feathers and bundles of twigs as brushes!!! I think this is a very beautiful form of art. And what an astonishing lady, Esther Mahlangu at 80 years old doing all that she has achieved and most of all, she is teaching the young people this important trade so that their tradition does not die out once the older generation is gone ! Well done Esther. 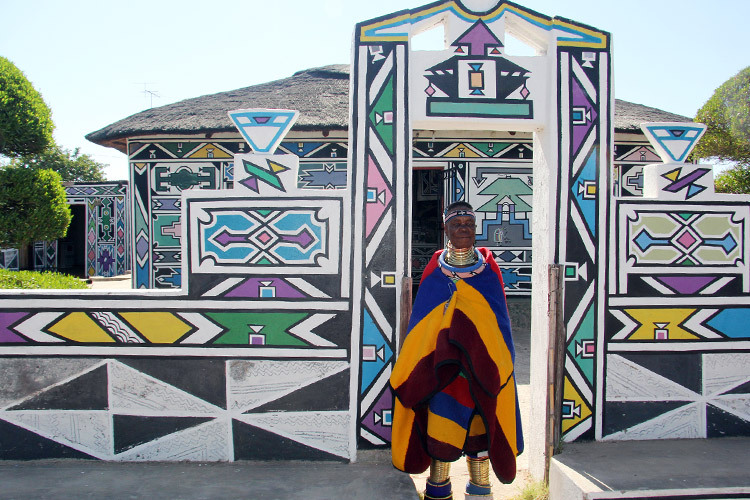 I hope the young generation will continue learning this unique and interesting form of art which is found nowhere else but among the Ndebele tribe of South Africa. 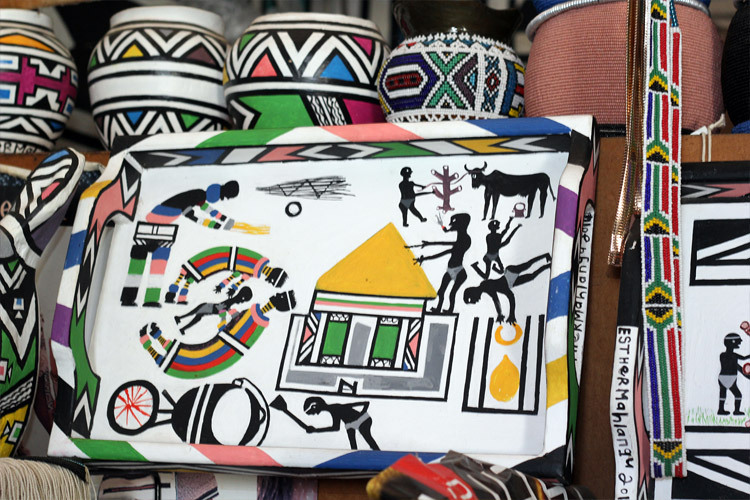 Where to buy Ndebele artworks (paintings) etc in Gauteng? Phambili ngesiNdebele, phambili! Ubuhle besikhethu ke lobo. AmaNdebele nations should celebrate and be proud about their unique art form so that the new generation should know about this. Halala! Gogo uNoStokana, Halala!